Written by chris maroulakos on Wednesday, April 25th, 2012 at 9:30am. The sun had already set at the Coachella Valley Music and Arts Festival, but temperatures remained high. Serpentine lines formed at incandescent food stands as people sought quick sustenance before rushing over to watch increasingly big-name acts begin their sets. And, thanks to constant radio play in recent months, there were few acts on Saturday bigger than The Shins. Over the years, The Shins have slowly evolved into a James Mercer solo project, but that’s just the way he likes it. The always-professorial frontman pleased the main-stage crowd with his powerful vocals, buoyant melodies, and immaculately trimmed beard. Mercer wasted little time before getting to radio hits “Australia” and “Simple Song,” then segued into more introspective fare like “Saint Simon” — off 2003’s Chutes Too Narrow, still the band’s best album — and “It’s Only Life.” This year’s Port of Morrow may have been The Shins’ weakest effort to date, but Saturday’s enthusiastic turnout proved that, as long as they stock each album with at least one hit single, the good will of their fans will remain strong as ever. Feist willfully avoided radio hits on last year’s Metals, a dark, dense, and at times difficult album. But her larger-than-life performance at the Outdoor stage lent those songs an irresistible intensity that vastly improved on the recorded versions. 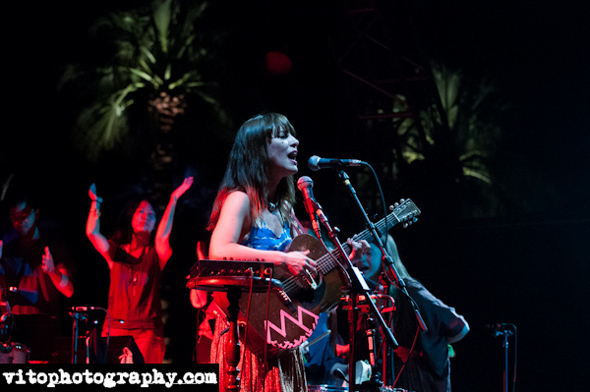 With her trademark bangs and glittering jacket, Feist proved a cute and confident frontwoman, backed by a polished band of over a dozen musicians. Her songs oscillated between energetic (“My Moon My Man”) and moody (“Graveyard”), but her breathy vocals and cheery confidence remained a common thread. Even “A Commotion” — a grating, skip-worthy track on Metals — flourished in the hands of the capable live band, helping to make Feist’s set one of Coachella’s undeniable highlights. Of course, as 11 o’clock rolled around and the $9 Heinekens finally began to take hold on the crowd, there was still one last highlight to be had. 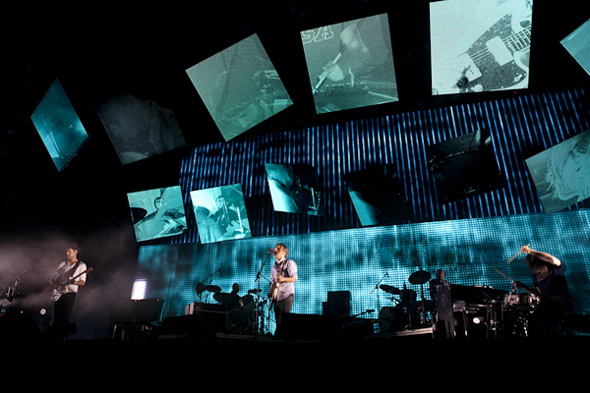 A little band called Radiohead capped off the night with a characteristically sweeping set, augmented by a dazzling stage setup that employed giant displays, vivid colors, and seizure-inducing strobe lights to hypnotic effect. Last year’s disappointing The King of Limbs will probably go down in history as the moment Radiohead finally drifted out of orbit and into realms most mere mortals can’t fathom (or, at times, enjoy), but even those songs sounded fantastic live. And as good as the Limbs material was, the band’s earlier songs sounded even better. Classics like “Idioteque,” “Pyramid Song,” and “You and Whose Army?” were downright transcendent, with Thom Yorke showing off his limitless vocal range while the rest of the group performed sonic somersaults behind him. As always, Yorke was an impish and playful frontman, mugging during closeups and allowing the audience to sing the bridge of “Karma Police” for him. As of The King of Limbs, Radiohead’s recorded works may officially be in decline, but no one can ever say the same of their stellar live performances.